How long has it been since you drove? Actually, have you ever driven in Seoul? Unwind your desires to zoom around the city with this week’s DealKo: for 10,000 KRW, you will get to Go Kart your heart out (a 20,000 KRW/10 minutes value) at Korea Kart in Jamsil. 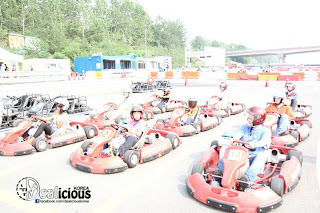 As one of the leading Go Kart venues in Korea, Korea Kart brings to you full and exclusive access to its Go Kart track for 2 hours, from 3:00 PM to 5:00 PM, on June 18th, 2011. Since we will have the entire place to ourselves, we can pretty much do whatever we please, ranging from racing to Mario Kart simulation. And of course, since every DealiciousKorea event involves food, we will be offering snacks and beverages (not sure about beer since it may be considered drunk driving). Afterwards, we will have a group dinner for those interested, which I am assuming, will be all of you :). See you this coming Saturday! - Limited to 1 per person.